In a bowl, whisk together plain flour,baking powder and baking soda. In another bowl, add the yoghurt and beat well. Add sugar and salt and mix well until dissolved. Add the flour mixture and milk alternatively and mix well using a whisk without any lumps and keep it aside for 10-15 minutes. 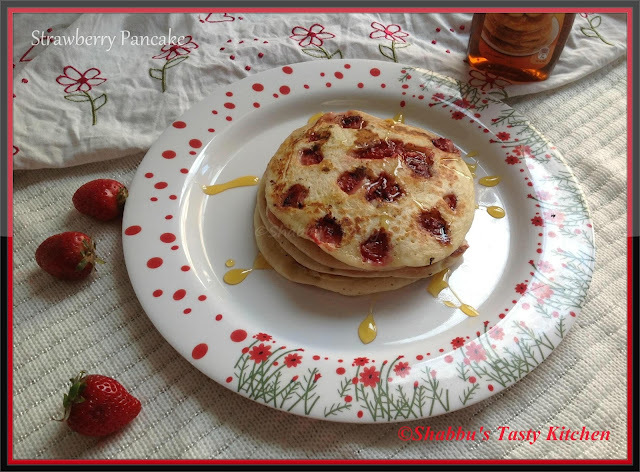 Using a small ladle or scoop, pour about 1/4 cup pancake batter onto the hot pan and evenly sprinkle chopped strawberries on top. When the bottom of the pancake is golden brown and bubbles starts to appear on the uncooked top surface of the pancake, turn over. Cook until golden brown for about 2-3 minutes.